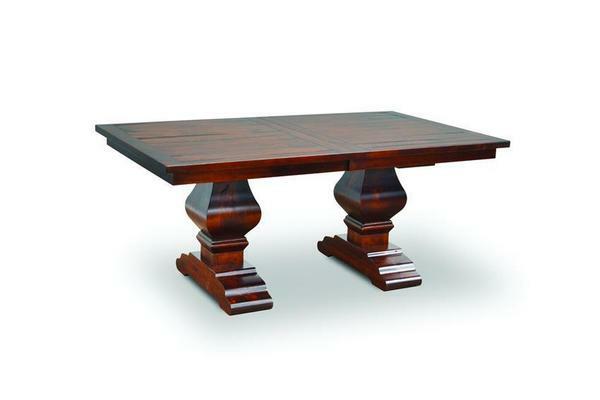 Our Amish Wilmington Plank Trestle Table is one of our largest dining room tables. Choose from a 42" x 72", 48" x 72". The standard option is a solid top without extensions but you can also add up to three 16" extensions which could make the table a total of 60" wide by 120 long! This table can seat the whole family at Christmas or Thanksgiving for sure! This Amish Trestle Table has a Mission Table Edge with a Rustic Plank Top with Saw Marks and Breadboard Ends with walnut plugs. You can also choose to order it with a plank top without saw marks or a smooth regular table top. If you choose to add extensions to the table then these extensions will also be planked and have saw marks unless the smooth top is ordered. This Amish Wilmington Plank Trestle Table is shown with our Wilmington Chair. The Amish Wilmington Pedestal Table also comes in a Single Pedestal Style. If you are looking for matching chairs then consider the Amish Wilmington Dining Chairs. Set shown from LaGrange Amish Chair Collection Wilmington chair.